If the seven-member comedy act that was the October 18 gubernatorial debate can be said to have had a serious message, it was likely this: It’s the jobs, stupid. Amid the prostitution jokes, one of the most pressing questions of the night was how New York’s next governor plans to address an economic future that looks, by anyone’s reckoning, bleak. 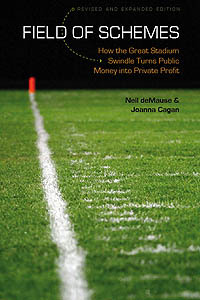 This entry was posted in Articles, Corporate Subsidies, Economics, Government, Tax policy by Neil deMause. Bookmark the permalink.